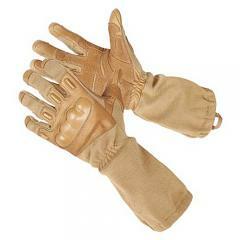 Blackhawk's traditional Fury glove model has been upgraded to a heavier duty model with the Fury HD and full integration of Nomex material. The Fury HD retains the extended gauntlet design, providing ample wrist and lower arm protection. Interior padding and molded hard shell knuckles and fingers combined with leather reinforced fingertips and palm cradles provide exceptional protection against impacts as well as added levels of wear resistance that guarantee lasting durability. Thanks to the integration of its DuPont NOMEX finish, wearers are safeguard against flash fires, flame and extreme heat in addition to water resistance. The HD version includes a nylon loop at the wrist for greater ease when putting them on as well as a convenient attachment point for a carabiner. Canadian Badge - B701 - 1 15/16" x 2 13/16"